2010 Lincoln Cents are the topic of the week on the November 26th edition of Coin Chat Radio. Numismatic News Editor Dave Harper talks with Standard Catalog author George Chula about the 2010 penny. "I think the Union Shields a pretty simple symbol," responds Standard Catalog Author George Cuhaj when asked about his opinion of the reverse design. "I mean simple, as in it gets the point home and it’s not cluttered. I kind of like the design." "The shield of the United States is a symbol of the union, so I think it works just fine" comments Cuhaj when Harper asks if the coin design conforms to the legislation requiring it to "symbolize the preservation of the American Union." "Is it good art?" questions Harper. "It’s simple art," replies Cuhaj. "And for coins, especially coins that are struck in huge quantities on high speed presses, you need simple art. It is not a graphic design, it is sculptural. There’s a relief modulation, so it comes off nice." "What we’ve seen this year and what we started to see a year ago at this time was…a market run-up. Just like a lot of different assets would over time, to the point where they were probably over-valued in a lot of cases, and this year has been a correction of that." "My outlook on things…is that high quality, rare, stunning material will still command a premium, but that common, more easily found, lesser grades, that kind of stuff, probably won’t be headed back on the way up yet." 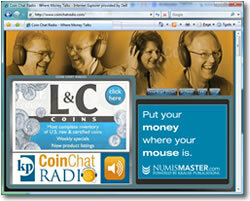 To listen to episodes of Coin Chat Radio, including this one, you can go to their website at www.CoinChatRadio.com. they should make an copper cent for 2010 mint and proof sets,they can make a lot of money on copper cents.